Google just unveiled it's biggest search product in recent memory, except this time the search giant is looking to take over the world of virtual objects. 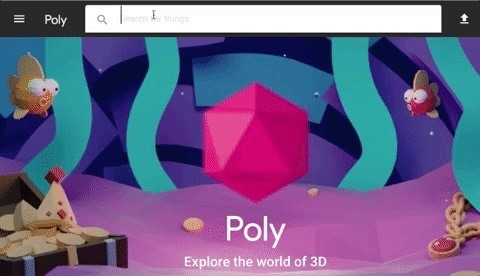 On Wednesday, Nov. 1, Google launched Poly (as in polygon, get it? ), a massive database of searchable 3D objects that augmented reality and virtual reality developers and immersive computing hobbyists can use to populate their apps. In addition to the vast selection of traditional 3D objects included in the database, Poly also offers access to virtual objects and scenes created in Google's Tilt Brush and Blocks, two apps that allow users to sculpt and build 3D objects in VR. "Poly was built from the ground up with AR and VR development in mind," said Poly product manager Andrea Zvinakis in a statement. "Whether you're creating an intense space walk in VR or a serene garden of AR flowers, you'll find the ingredients you need in Poly." And while we still don't know the exact number of objects available in the search database, because Poly is natively integrated with Blocks and Tilt Brush, the options for quickly constructing AR environments using Poly-sourced objects are immense. You can either search for specific objects, or browse categories such as Art, Animals & Creatures, People & Characters, Technology, Transport, Food & Drink, Places & Scenes, and several others. The objects made available on Poly are licensed under a Creative Commons license (CC-BY), which allows users to use and remix objects as long as they credit the original creator. Anyone is free to upload their own OBJ files or Tilt Brush- and Blocks-created objects. And if you'd rather not share your work with the public, you can opt to make your 3D creations only visible to yourself or those you share a special link with. 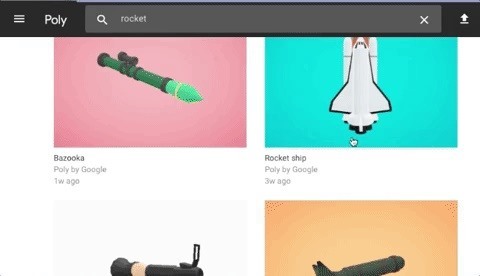 There's also an option to quickly download GIFs of anything you find after executing a Poly search, making it even easier to trade reviewable examples of 3D objects and scenes between developers before committing to deploying them in apps. A few startups have tried launching similar 3D object marketplaces to serve the growing AR and VR developer communities but, so far, the one with the most traction has been Sketchfab, based in New York. The company claims to have 1 million registered users and over 1.5 million 3D models on its site. But even though Sketchfab has a fairly active community of 3D object creators, the entry of Google into this space both validates Sketchfab's mission and simultaneously puts it in the crosshairs of one of Silicon Valley's leading players. Nevertheless, whichever 3D marketplace comes out on top, it's the users who will ultimately be served by an even more robust marketplace for 3D objects that will make their way into thousands of ARKit and ARCore apps in the coming months.